Rule the world all from the comfort of your seat! Look like one of Superman's arch-nemesis in your office or at home. Limited edition patented Chair Cape™ adjusts to most sized chairs! Entertainment Earth Convention Exclusive! Take over your office or party by adorning your chair with the patented Chair Cape™ from Entertainment Earth! This Bizarro Chair Cape - Convention Exclusive is 24-inches long and includes a sturdy yet highly adjustable hook and loop based belt and strap to fit most size chairs*. Made of high quality fabric materials, the cape and strap are both 100% Polyester. Give the impression you are dawning the cape of the infamous super-villain every time you sit down! 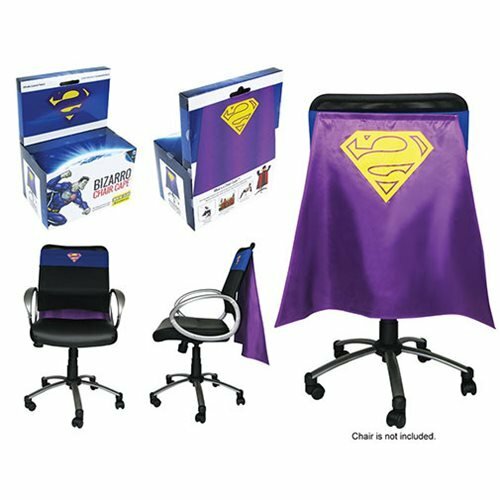 The elegantly designed purple cape features the Bizarro Superman logo in yellow with an additional purple and yellow Bizarro emblem on the adjustable blue chair strap. Capture this individuallly numbered limited edition of 1,200 pieces one-of-a-kind patented Chair Cape™ from Entertainment Earth before it flies away forever! Ages 14 and up. Justice League Movie Batman Chair Cape - Con. Excl.